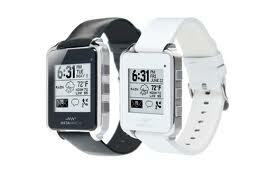 Video description: Shows how Augmented Smartwatch Pro v 4.0 makes the Pebble watch even better. Note that app supports Pebble, Sony Smartwatch, and Metawatch. I’ve been using the Augmented Smartwatch Pro Android app with my smartwatches over the past few weeks. It extends smartwatch capabilities in such a useful way that I consider it a “must have” app. The “All other notifications” section lists nearly every app on my Note II, and based on my selections, Augmented Smartwatch Pro pushes notifications for Carbon for twitter @ messages and my Conscious app mindfulness reminders. I recently learned about its robust Fitbit daily data support, and now can see how long I slept, how many steps I’ve taken, calories, etc., displayed in charts (!) on my Sony Smartwatch. For a fitbit data geek, this is nirvana! I can also configure Augmented Smartwatch Pro’s quiet time settings to ensure I don’t receive smartwatch notifications during the night. What I’ve listed above barely brushes the surface of the functionality the app brings to smartwatch use. I highly recommend it. The developer is both responsive and very experienced in writing smartwatch-related apps. There’s a free version available, too. Strongly suggest going ahead and getting the Pro version — as smartwatch users, it’s in our best interest to support active, hard-working smartwatch app developers! I recently received the Pebble watch I’d ordered via Kickstarter. Using the Pebble got me wondering what other smart watches were like. So, I picked up a few more to check them out — my experience is based on using these watches paired with my Android (Note II) phone. Spoiler: The watch I liked best was the one I’d expected to like the least! I found it confusing to set up: There is an official Metawatch app in Android market, and then some open source apps with much higher ratings — the only catch is that the open source apps don’t appear to completely support the latest metawatch firmware (1.3) for each hardware rev. Due to the compatibility issues noted above, i was unable to use the six hardware buttons for their secondary functions. I also noticed the watch seemed to freeze up when receiving notifications (I believe this is a resolvable software/firmware issue, but frustrating nonetheless). As a consumer device, the Metawatch app/widget ecosystem seems limited (at least for Android; may be better for iOS). Uses a clip-design USB charger which I found challenging to get seated properly on the watch. Battery life seemed quite good. I loved the MetaNeko app where a cute kitty plays on the screen. While the hardware and screen are lovely, I found the physical size of the watch bigger than I feel comfortable wearing (especially at the office). Watch functionality is mainly focused on providing notifications from your smartphone. Rather than repost my initial impressions about the Pebble and its e-paper display, here’s a link to last week’s Pebble post. While the watch is smaller and less obtrusive than I expected, it has a built-in clip on the back that you can attach to clothing, or using an included adapter, attach to your own watch band. That clip makes it sit higher on your wrist, and the fact that the clip is white (against the metal watch) makes it stand out all the more. There are a lot of Sony SmartWatch apps in the Android play market, some from Sony and others from third-party developers. Everything I’ve tried so far has worked well, no freezes or other odd behavior. Unlike Metawatch and Pebble, I believe the Sony SmartWatch only pairs with Android phones — I don’t think it’s iOS compatible. Unlike Metawatch and Pebble, Sony SmartWatch has a greater focus on onboard apps (vs simply displaying smartphone notifications). This enhanced functionality made the Sony SmartWatch extremely useful for me — there are times I want to reference information on my phone but don’t feel comfortable pulling out my phone. Being able to casually glance at my watch to flick through my twitter stream has been super handy, especially as someone who uses twitter to keep up with breaking news events. The colorful screen eats up battery much more quickly than the other two grey-scale display smart watches. Still, it’s lasted throughout the day even with a variety of notifications enabled (including full sync of my twitter account each hour). My favorite of the three smart watches? I’ve found the greatest utility (for me) in a smartwatch isn’t the notifications but rather easy accessibility to data that’s otherwise on my phone (e.g., my gmail inbox, calendar, twitter stream). The Sony SmartWatch offered the greatest utility in this regard since the other smart watches I tried both focus more on displaying notifications. And interestingly enough, it’s also the most affordable (currently offered on Amazon at about $90).